Presenting Lenore: Sign up for the Book Bloggers Holiday Swap! Sign up for the Book Bloggers Holiday Swap! It's that time of year again!! 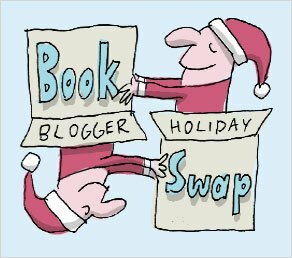 Sign-ups are now open for the Book Blogger Holiday Swap. If you want to make a fellow blogger very happy this holiday season by being their bookish secret santa, see how it all works and sign-up by November 14th! You can also get all your questions answered on the Frequently Asked Questions page. But please, ONLY sign up if you really intend to follow through and send your gift by the shipping deadline. Do you plan to join in the fun this year? I signed up yesterday. It was so fun last year trying to think of creative ways to give a blogger something they would love! I just signed up! I'm really excited to get things for my blogger person! I'm really excited about this! It sounds like fun! Yay! Love this event and really want to participate again this year! I signed up for this as soon as possible! I had a lot of fun participating last year. Hot Topic: Does a YA novel have to be accessible?